Dynamo can operate on a Revit project or family definition when it is launched as an addin within Revit, which requires the open-source version of Dynamo available from DynamoBIM.org. Other means of accessing Dynamo technology, which include Autodesk Dynamo Studio and the standalone version available from your Windows Start Menu, do not have the ability to make changes to a Revit file because they do not function as an addin. Libraries and custom nodes or packages that have a dependency on Revit will not appear in Dynamo unless Dynamo is running inside of Revit, so if you are missing your Revit library, chances are you are not using the required instance. When Dynamo is installed correctly and you have a supported version of Revit, you will find Dynamo in the Addins tab. Dynamo does not have units built in internally (meters, feet, Newtons, etc. ), so for example when you specify that the length of a line is 5, it is simply 5 until such time as you send that information outside of Dynamo. How another program or file format may interpret 5 may differ based on what makes the most sense. When you export an SAT file from Dynamo, the node requires you to specify how 5 should be interpreted: centimeters, inches, feet? With Revit, the value specified by Dynamo simply gains whatever units are appropriate for the quantity in question, which means that Dynamo effectively adopts your project units. If you specify the length of beam is 5, Revit will interpret that as 5 mm if your length units are mm or 5 ft if you are working in Imperial units. For element parameters, a value of 5 in Dynamo becomes 5 ft, $5, €5, 5 Nm, or whatever else is required for that parameter. Reading values from Revit works the same way: 5 ft, “5”, and 5 kN/m2 are all read by Dynamo as simply 5. For more, see Units in Dynamo 0.8. Note that, as a consequence, for projects in mm, when referencing geometry from your Revit project, you may have to zoom out to see it in the background preview in Dynamo. 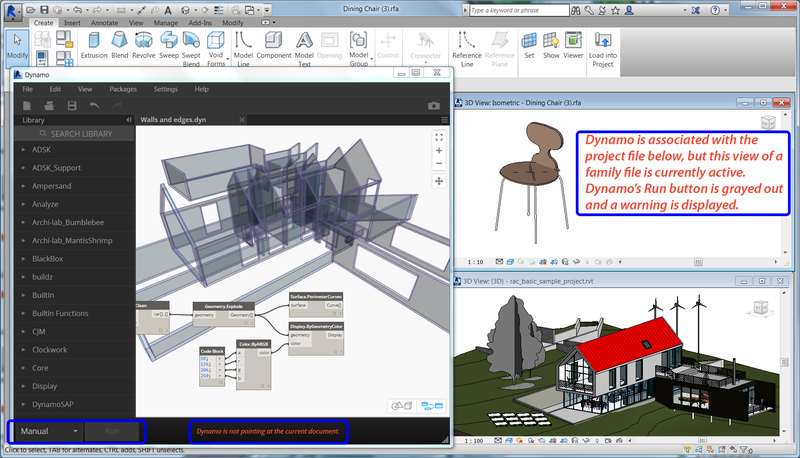 In Revit, Dynamo is associated with the file and the view from which it was launched. This is important to note because you may have several files open in Revit at a time, and several views for any one project or family. The changes you make to a Revit file from Dynamo will only apply to the project or family that Dynamo is connected to. In the Automatic mode, Dynamo will stop making changes if the user’s focus in Revit is in another project or view. In the Manual mode, you will notice that the Run button is gray and can’t be pressed when you are working in a different Revit file. By default, when a new Dynamo definition is created, it is in the “Automatic” mode, which means that the Dynamo definition runs each time there is a change so that it stays live and responsive. For some workflows, a user may want to change this behavior to “Manual,” so that the Dynamo graph only executes when the Run button is pressed. If the goal is to make a large number of changes in Revit, it may be most efficient to run manually. See a structured explanation of Dynamo for beginners and for long-time users. Ask questions, search for answers, and help others.